PE0220. THE HAPPY DAY (Sidney Jones & Paul Rubens), w.Merlin Morgan Cond.Daly's Theatre Ensemble; Thorpe Bates, Jose Collins, Winifred Barnes, etc. (England) Palaeophonics 113, recorded 1916, Complete, as Recorded, w.Elaborate ‘The Play’ 20pp. Brochure replete w.photos from the London production & facsimile of original brochure. 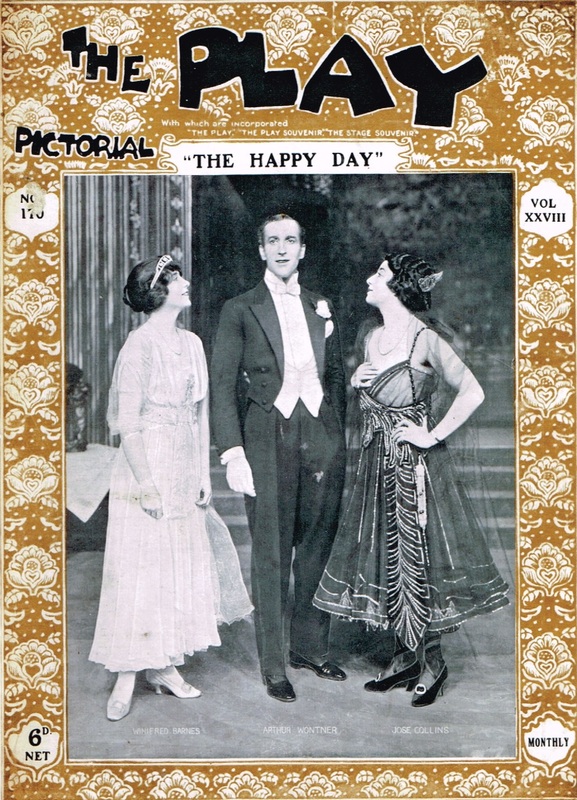 THE HAPPY DAY was produced at Daly's Theatre, London, on 13 May, 1916, enjoying a run of 241 performances. “THE HAPPY DAY is an musical comedy in two acts by Seymour Hicks, with music by Sidney Jones and Paul Rubens, and lyrics by Adrian Ross and Rubens. It was produced by George Edwardes' company (by the estate's executor, Robert Evett) and was directed by Evett. The story concerns a royal couple who dislike each other but ultimately fall in love. A masquerade scene provides opportunities for mistaken identity. The musical opened at Daly's Theatre in London on 13 May 1916 and ran for 241 performances. It starred Winifred Barnes, José Collins and Arthur Wontner, who played the Ruritanian prince. Later Bertram Wallis joined the cast. 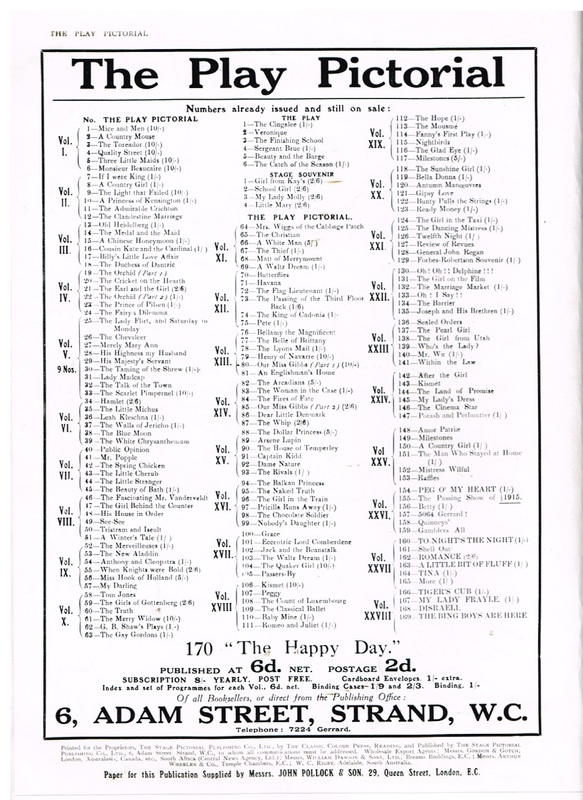 THE HAPPY DAY opened during World War I in the same year as three other tremendously successful shows in London: CHU CHIN CHOW, THEODORE & CO AND THE BING BOYS ARE HERE. Audiences, including servicemen on leave, wanted light and uplifting entertainment during the war, and these shows delivered it. The show was Jones' last success. A review in The Illustrated London News commented that the costumes were ‘sumptuous’ and praised the comedy and the music of the piece, as well as the cast, especially Collins ‘with her attractive voice and picturesque personality’." Two of the popular songs from THE HAPPY DAY were ‘Bohemia’ and ‘I Don't Seem to Want You When You're With Me’. Sidney Jones, was an English conductor and composer, most famous for producing the musical scores for a series of musical comedy hits in the late Victorian and Edwardian periods. Jones' most famous musical was THE GEISHA, but several of his musicals were among the most popular shows of the era, enjoying long runs, international tours and revivals. Jones then worked for Henry Leslie for nearly four years as conductor of tours of Alfred Cellier's comic opera hit DOROTHY (starring Lucy Carr Shaw, sister to George Bernard Shaw)….in 1892, after nine years of touring, Edwardes hired Jones to conduct the musical IN TOWN at the Prince of Wales Theatre on London's West End. He next was musical director for another West End musical, MOROCCO BOUND (1893), and for the London production of THE GAY PARISIENNE (1896). At the same time as these conducting engagements, Jones had begun composing incidental music and songs as needed for the shows he conducted. In 1889, he wrote the musical score for the pantomime ALADDIN II, which played at Leeds. When Edwardes' touring company produced CINDER ELLEN in Australia, Jones wrote a dance number that was added to Meyer Lutz's score. Jones also composed an operetta, OUR FAMILY LEGEND (1892), with a libretto by Reginald Stockton, which was produced at Brighton. In 1893, one of his songs, ‘Linger Longer, Loo’ was added to Lutz's 1892 burlesque DON JUAN at the Gaiety Theatre. The song became popular throughout the English-speaking world and inspired a drawing by Toulouse-Lautrec of Yvette Guilbert singing it. In 1893, for A GAIETY GIRL (1893), with a libretto by Owen Hall, Edwardes gave Jones the opportunity to write the music, and the result was a hit show that enjoyed a long run and toured internationally, setting the trend for a new genre of popular musical theatre that came to be known as Edwardian musical comedy. Jones' style was similar in technique to the music of Arthur Sullivan and Cellier, which Jones had conducted for so long, but it was lighter and breezier, appealing to the popular tastes of the time. Jones soon became house composer and music director for George Edwardes' new Daly's Theatre. After A GAIETY GIRL, Jones again collaborated with Hall and lyricist Harry Greenbank to produce another success, AN ARTIST'S MODEL (1894), which ran for fifteen months. This was followed by three of the most successful musical comedies of the 1890s: THE GEISHA (1896), A GREEK SLAVE (1898), and SAN TOY (1899). Jones' musical plays were ‘written in a more musically substantial style than the featherweight entertainment given at the Gaiety. Their librettos sported a solid and serious romantic backbone (confided to the baritone hero Hayden Coffin and the soprano Marie Tempest) alongside their comic and soubrette elements, and the scores which Jones provided included, alongside the lighter material, numbers sentimental and dramatic, as well as some impressive and vocally demanding concerted ensembles and finales....Jones' song from THE GEISHA, ‘The Amorous Goldfish’ became an oft-sung hit, as did several of his other songs for these shows. THE GEISHA took advantage of the fad for oriental settings in musical theatre that had been established by Gilbert and Sullivan's THE MIKADO in 1885. THE GEISHA and SAN TOY were frequently revived, recorded and widely toured in Europe as well as throughout the English-speaking world. The former became the most frequently-performed English-language work of musical theatre in Europe for many decades.